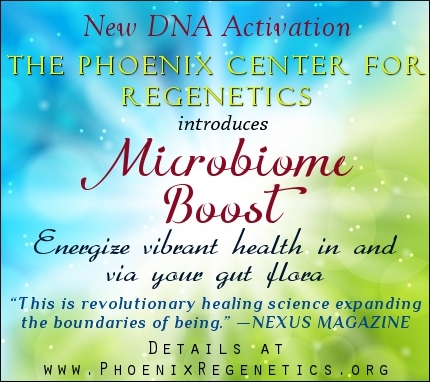 We at the Phoenix Center for Regenetics are thrilled to introduce a brand-new DNA activation: Microbiome Boost. This powerful “ener-genetic” activation is designed to foster wellness by enhancing the harmony—the functional synergy—between the recipient’s bioenergy blueprint and microbiome. It has long been known that a harmonious bioenergy blueprint (also known as the aura) is foundational to good health, as explained on our website and in our two books on the “revolutionary healing science” (NEXUS) of the Regenetics Method, CONSCIOUS HEALING and POTENTIATE YOUR DNA. Today, scientists are discovering that our microbiome also plays a critical role in our ability to sustain homeostasis and wellbeing. 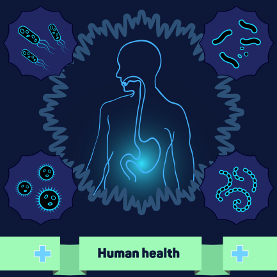 The microbiome is the sum of microorganisms, including their DNA, found in the human body. Amazingly, our microbiome—which consists of bacteria, yeasts, Candida albicans, and many other organisms—contains far more DNA than our own cells and tissues! 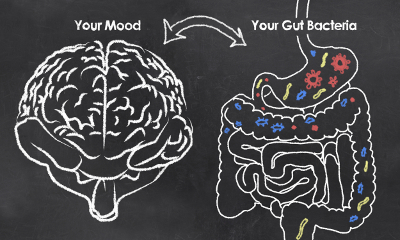 A balanced microbiome performs a myriad of vital functions—promoting good digestion and elimination, modulating immune and stress responses, helping control body weight and blood sugar levels, and maintaining proper communication pathways between the gut and brain. 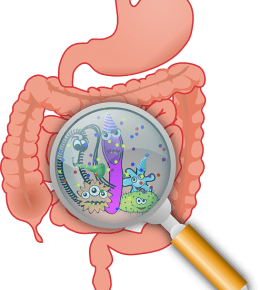 The microbiome can become imbalanced as a result of trauma, chronic stress, pathogens such as those found in vaccines, or toxicity induced by such factors as heavy metals in dental work, vaccine adjuvants, pesticides, and other harmful chemicals. When this occurs, a virtually limitless number of physical problems can result—from relatively minor inconveniences such as skin rashes and toenail fungus to life-altering issues in the form of Leaky Gut, Chron’s disease, and other autoimmune conditions. Additionally, it is thought by more and more researchers that a damaged microbiome is the most likely cause of mental illness, including depression, anxiety, and even psychosis. Others have gone so far as to claim that microbiome problems underwrite ADD, ADHD, and autism. Obviously, in the interest of personal and public health, it behooves us to learn how to strengthen and restore our microbiome. But how do we do this? Until now most approaches to strengthening and restoring the microbiome have been of a physical (what bestselling author Dr. Larry Dossey calls “Era I”) nature. These approaches include elimination diets that often target Candida, which tends to overproliferate in proportion to how imbalanced the microbiome is. Eating traditionally fermented foods such as yogurt and sauerkraut and consuming probiotics are also typically recommended. While these approaches can be beneficial, many like ourselves have discovered that it is an exercise in futility trying to starve away Candida, which nearly always overgrows again if the microbiome balance has not been significantly—and permanently—improved. The difficulty here is that without releasing the underlying pathogens and toxins that are likely a primary cause of the imbalance, a permanent solution to Candida is impossible. This is because Candida is designed to clean up toxins and pathogens! Simple dietary changes, by themselves, can be insufficient to remove these factors entirely from our system. As for fermented foods and probiotics, those suffering from autoimmune conditions and allergies often do not do well consuming them in any quantity. In fact, according to Dr. Zach Bush, developer of arguably the one supplement with the capacity to intervene in the case of a severely damaged microbiome (Restore), long-term overconsumption of probiotics has the potential to create a “monoculture” in the biome that decreases the latter’s diversity and renders it even less equipped to function in healthy ways immunologically. On the subject of diversity, leading holistic medical doctor Thomas Cowan makes a strong case that sustained gut health can be promoted by consuming a diverse variety of nutritious plants in small amounts daily. Some of the most nutritious plants are perennials that are not widely available commercially. Dr. Cowan created Dr. Cowan’s Garden, “nutritionally powerful and playful vegetable powders,” to offer a way to consume an array of vital whole foods in potent, concentrated powder forms. According to Dr. Cowan, enriching one’s diet with these powders imparts benefits ranging from micronutrients to increased microbiome diversity. In addition to physical, Era I avenues for fostering wellness in the microbiome, we also see a number of mind-body (“Era II” in Dossey’s model) approaches being put forward. Recommendations in this arena range from lifestyle changes and meditation practices to reduce inflammation and stress (both of which have a far more negative impact on the microbiome than some might think) to counseling, visualization, affirmations and other techniques for calming the mind and body and opening up space for supporting the microbiome. These epigenetic approaches, while potentially beneficial, are generally considered supplemental or complementary therapies for enhancing the effects of more far-reaching dietary changes. In other words, it is unreasonable to expect a purely mental shift—by itself—to heal a chronically imbalanced microbiome. That said, any epigenetic technique that can reduce stress and inflammation and improve hormonal and immune signaling via a better overall outlook can help keep a healthy microbiome intact and assist other modalities in restoring a damaged microbiome. As explained by Dossey in REINVENTING MEDICINE: BEYOND MIND-BODY TO A NEW ERA OF HEALING, the frontier of medicine lies neither in the physical (Era I) nor mental (Era II) realms, but in the nonlocal domain of Era III techniques. Such techniques invoke the power of universal consciousness—the greater aspect of ourselves, the matrix of creative energy in which we exist—to heal and transform our lives in ways that transcend the body and brain. In Healing Words Dossey examines prayer as an example of what he calls “Era III medicine,” citing a wealth of scientific literature proving the extraordinary (if still little understood) power of prayer to heal even quite serious conditions. The connection between language (“healing words”) is further explored in the pioneering work of biophysicist Peter Gariaev, the father of “wave-genetics,” where human speech embedded in radio and light signals has been shown to be capable of curing life-threatening diseases and even regenerating damaged organs. As explained in CONSCIOUS HEALING, the Regenetics Method can be considered a specialized form of healing prayer, or “Active Prayer” to use Gregg Braden’s term from THE ISAIAH EFFECT: DECODING THE LOST SCIENCE OF PRAYER & PROPHECY. Regenetics can also be conceptualized as a human-potential-based application of wave-genetics, in which language in the form of special vowel sequences is simultaneously applied vocally (through chanting) and mentally (through thought) to activate the recipient’s DNA. 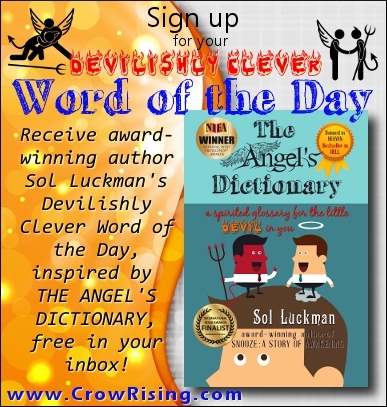 DNA, in turn, broadcasts signals that prompt changes in the individual’s bioenergy blueprint, directing the latter to fortify, heal or transform specific parts of the body, mind, and spirit. In the case of Microbiome Boost, this exciting new Regenetics DNA activation ener-genetically helps restore a healthy relationship, or feedback loop, between the bioenergy blueprint and microbiome. When the microbiome clearly communicates with and begins to receive proper instructions from the ener-genetic blueprint that regulates physiology, profound changes in our internal floral balance can occur, resulting in equally profound changes in various conditions that stem from an imbalanced microbiome. Those wishing to experience Microbome Boost must first have passed the “sealing phase” of the first DNA activation in the Regenetics Method, Potentiation Electromagnetic Repatterning. This means you must have experienced Potentiation roughly five months prior to receiving Microbiome Boost. There are three ways to be “potentiated.” You can have a Facilitator perform your session for you as explained here. 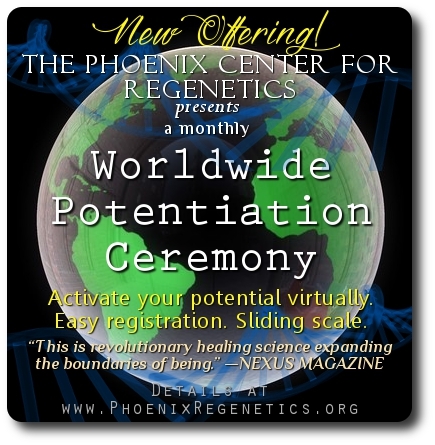 Alternatively, you can participate on a sliding scale in our monthly Worldwide Potentiation Ceremony. Or you can potentiate yourself. Q: Can I receive Microbiome Boost while experiencing other DNA activations in the Regenetics Method? A: Yes. So long as you have passed the sealing phase of Potentiation (which occurs at roughly the five-month mark), you can experience Microbiome Boost anytime, even while undergoing other DNA activations. Q: Why do I have to experience Potentiation before Microbiome Boost? A: Potentiation is the foundational DNA activation of the Regenetics Method that “resets” the bioenergy blueprint to a more stable configuration, making possible further enhancements to our bioenergetic functioning. Q: Is Microbiome Boost a primary or supplementary DNA activation in the Regenetics Method? A: Microbiome Boost is a supplementary DNA activation focused specifically on harmonizing our bioenergy blueprint with our internal microorganism ecosystem. The four primary Regenetics activations—Potentiation, Articulation, Eludication, and Transcension—are designed to clear ener-genetic distortions at the physical, mental, emotional and spiritual levels, respectively. Q: If I have already experienced all four primary DNA activations in the Regenetics Method, can I still benefit from Microbiome Boost? A: Absolutely! Even after transforming our bioenergy blueprint via Regenetics, we are still constantly exposed to environmental influences that can impair our microbiome. Microbiome Boost is designed to further harmonize and strengthen the biome during or after the Regenetics process. If you have passed the sealing phase of Potentiation, we invite you to participate in our next Global Microbiome Boost. 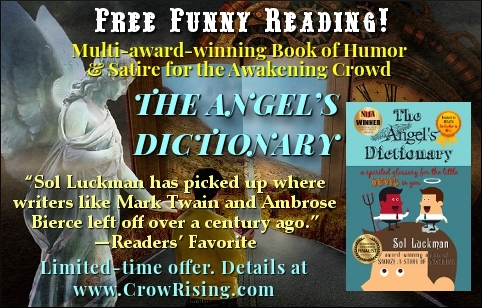 AFFILIATE DISCLOSURE: This article contains affiliate links. The Phoenix Center for Regenetics may receive a commission for purchases made by way of these links.